British voters will decide, probably this summer, whether the country stays in the European Union. A decision just as tough faces businesses already – whether to back Prime Minister David Cameron’s campaign to stay. He wants them not to “hold back”. If they take him at his word, it could backfire. Big companies have mostly stayed out of the debate. Part of that is no doubt because of an awareness that for now, it’s not clear what “In” or “Out” would look like. Cameron wants four big changes to the status quo, relating to migration and welfare, sovereignty, support for non-euro countries and productivity. If he doesn’t get them, the question is whether “Out” means losing free access to European markets, or having to follow European rules anyway. Both are plausible. Wall Street, perhaps misjudging the feelings of British voters, is tilting to “In”. Goldman Sachs and JPMorgan are donating large amounts of money to the campaign to stay in the union. For them, that’s a simple business decision, since an EU exit might lock UK-based trading businesses out of European markets. Large companies that do business across European borders have good reason to hope that Britain doesn’t jeopardise its trading rights. Companies will play an important role in influencing the debate. But the big companies who have the loudest voices aren’t necessarily the key. The biggest battle will be to persuade small companies – those with 250 employees or fewer – who make up 60 percent of the workforce, according to UK government data. What’s great for big business may be a turn-off for them. Meanwhile, financial facts and data don’t necessarily help. Wales, for example, is the poorest part of the United Kingdom, and its citizens will receive six times as much aid per capita from the EU’s structural funds between 2014 and 2020 as England will. Yet support for the anti-European UKIP party in 2015’s election was little different, at 14 percent of the vote. For most big companies, it makes little sense to speak up until Cameron has determined what concessions he can wring from Europe in return for Britain staying put. At least until then, the best gift they can give Cameron is silence. 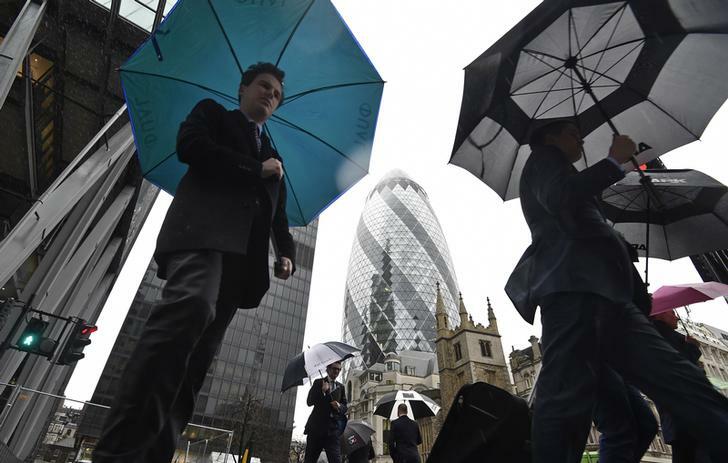 City workers walk in the rain in the financial district of the City of London, Britain January 7, 2016. British Prime Minister David Cameron asked businesses not to “hold back” in showing their support for the debate on whether the country should remain in the European Union, speaking at the World Economic Forum on Jan. 21. In front of an audience of invited delegates in the Swiss town of Davos, Cameron outlined his theory that the UK should stay in Europe, but subject to four changes to the status quo, which he described as “not outrageous asks”. Those changes are a more productive Europe; more support for non-euro countries in the bloc; a move away from the idea of “ever closer union”; and changes to migration and welfare policy. The Confederation of British Industry said in response that “business leaders, on whatever side of the debate, should feel able to speak out on the implications for their business of staying in or leaving the EU”. Goldman Sachs and JPMorgan are among U.S. banks donating to the campaign to keep Britain in the European Union, Reuters reported on Jan. 21, citing sources familiar with the matter.